I was that lady on the stair-master at the gym this morning. As in, Whoa — what’s up with that lady on the stair-master? I understand why I was getting the sidelong glances. Every so often I’d yell at the TV, “Are you kidding?” and throw up my hands. Eventually I stopped stepping altogether, saving my strength for eye rolling and looks of unmitigated disbelief. Muskingum Wild Animal Farm in Zanesville, Ohio, had been home to dozens of big game animals, including tigers, lions, cheetahs, giraffes, and grizzly bears. At some point yesterday evening, the farm’s owner, Terry Thompson, opened all the cages, cut the fences on the property, and then fatally shot himself. 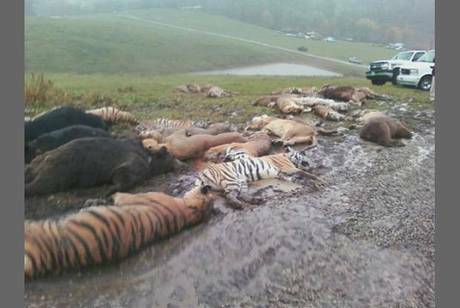 I understand that police have a duty to protect humans, but I hate knowing these animals spent their lives in captivity only to be shot to death as they hid from the rain. Was the alternative to tranquilize and relocate them to a safe and humane environment? Yes, that would have been ideal. Realistic? I guess not. Where in the U.S. do you rehome a cheetah to ensure it has a decent quality of life? Here’s the clincher (one of ’em, anyway). Thompson, the owner of the “farm,” was convicted in 2005 of animal cruelty. How does someone convicted of animal cruelty obtain a permit to own exotic animals? Apparently the order prohibiting convicted abusers from owning exotic animals had expired, that’s how. I’m not making this up. And I guess you have to believe that keeping tigers, leopards, and wolves in cages — animals who in their natural environment roam dozens of miles per day — is not in and of itself cruelty. Really, that’s the heart of the matter: it shouldn’t be an issue of legality, but of ethics. If the law says it’s ok to isolate a monkey from others of his species or completely deprive a Bengal tiger of mental and physical exercise, we need to change the laws so that they square with morality, decency, and compassion. There are so many ways this story is wrong, heartbreaking, and ultimately preventable. Ohio, if you didn’t hear the roars and howls early this morning, this is your wakeup call.